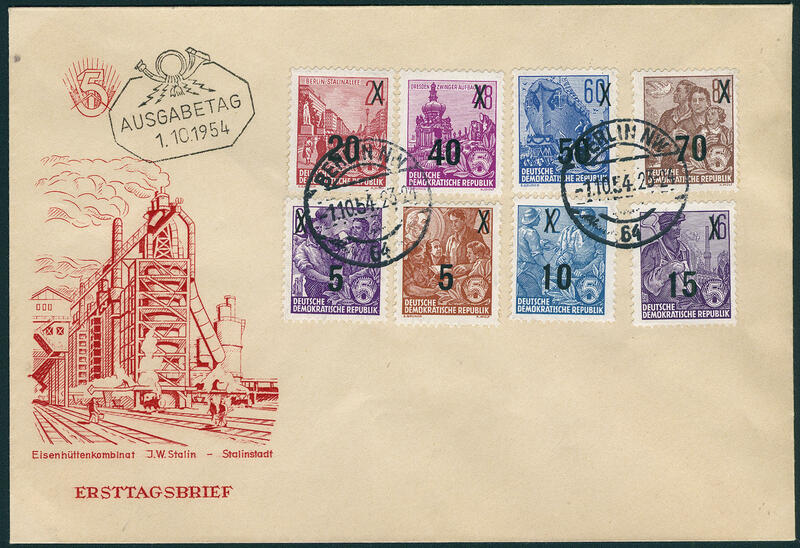 6254 FDC 435/42 Five year plan overprint set 1954 on faultless illustrated First Day Cover from \"BERLIN 1.10.54. \". Michel 900,- €. 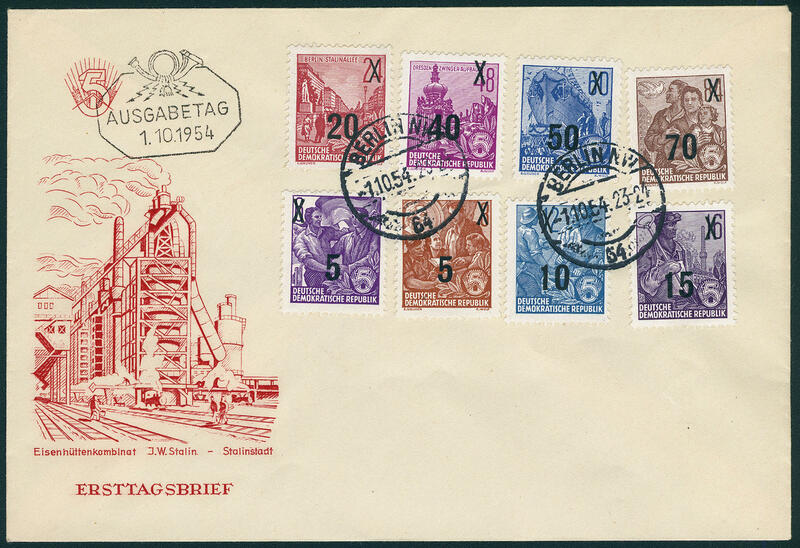 6255 FDC 435/42 Five year plan 1954, all eight values fresh colors and in perfect condition on very nice First Day Cover from \"BERLIN 1.10.54. \". Rare! Michel 900,- €. 6256 439aIIgXI 20 on 24 Pfg. 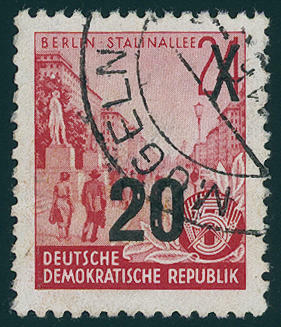 Brownish carmine, original stamp in the offset printing, shining typography overprint, the so-called \"initial printing\", fresh colors and very well perforated, in perfect condition mint never hinged in perfect condition. An extraordinarily scarce, nearly always missing issue! Photo expertize \"the condition is perfect\" Paul BPP. 6257 ⊙ 439aIIgXI 20 on 24 Pfg. 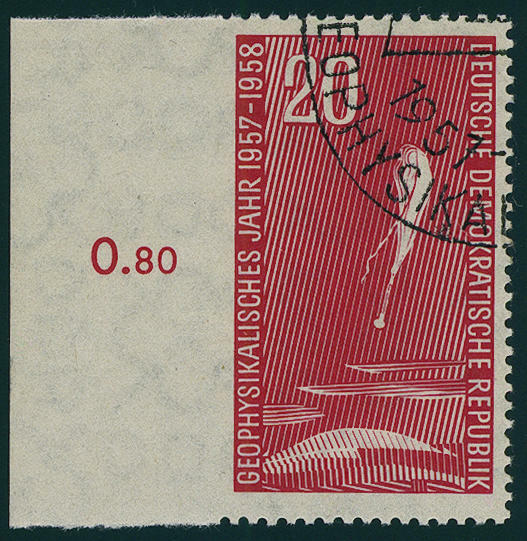 Brownish carmine, offset printing with shining typography overprint, the so-called \"initial printing\", fresh colors and very well perforated, neat cancelled \"MÜGELN\" in utterly perfect condition. 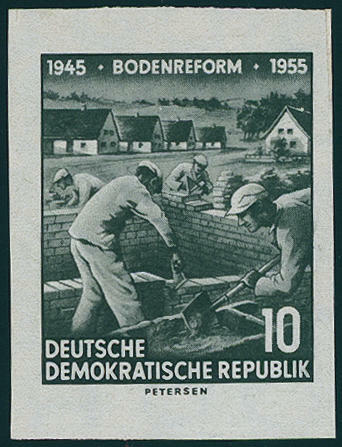 Especially in used condition are faultless examples this German Demokratic Republik (East Germany) rarity hard to find! Photo expertize \"the condition is perfect\" Mayer BPP. 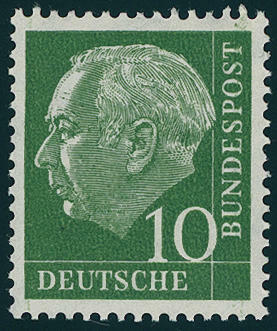 6258 Bl.12FI Schiller-block 1955 with extremely rare variety \"5 penny missing\", fresh colors and in original size, unused with original gumming. There are only few examples this spectacular variety have become known. 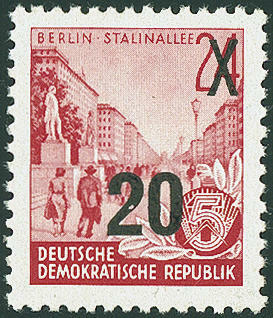 A significant GDR-rarity! Expertized Weigelt BPP. 6260 ⊙ 540YI 35 Pfg. 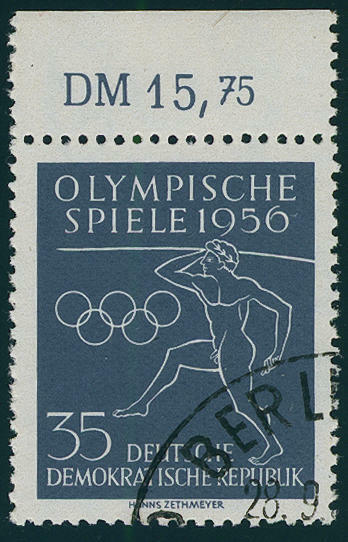 Olympic games 1956 with rare variety \"watermark German Demokratic Republik (East Germany) and posthorn vertical IN type YI\" from upper margin, in perfect condition with special cancel. There are only few examples from this known. By Michel catalogue only noted without price! Photo expertize \"the test specimen is genuine, perfect\" Schönherr BPP. 6261 ⊙ 616Ul 20 Pfg. Stratospheres balloon 1958 from left margin of sheet with rare variety \"left unperforated\", in perfect condition with appropriate special cancel. There are only a few copies became known. By Michel clearly undervalued! 6262 702Ur 25 Pfg. 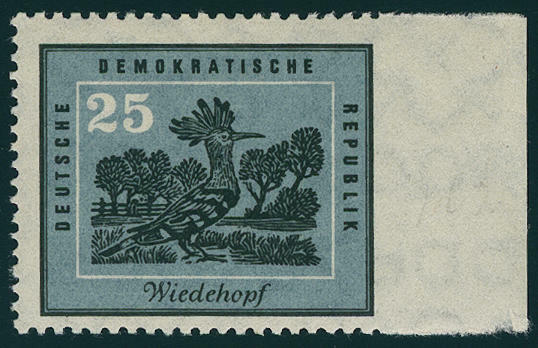 Hoopoe 1959 with very rare variety \"right unperforated\" from right margin of sheet, in perfect condition mint never hinged there are only few examples from this known. By Michel catalogue clearly undervalued! 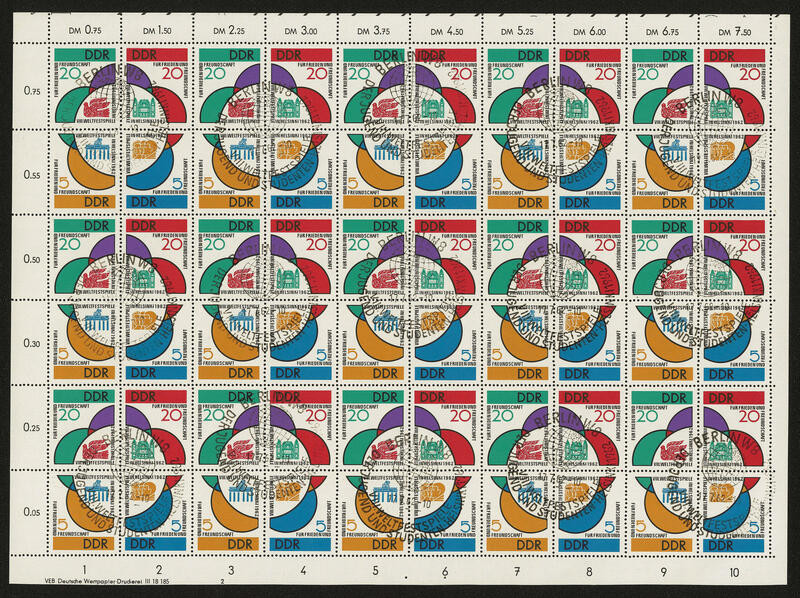 6263 901/04 World festival the youth 1962, the complete se-tenant sheet, unfolded and in perfect condition mint never hinged in perfect condition. Michel 380,- €. 6264 ⊙ 901/04 World festival the youth 1962, the complete se-tenant sheet with perfect first day special cancel \"BERLIN 17.7.62. \", unfolded and in perfect condition. In this quality rare offered. Michel unpriced! 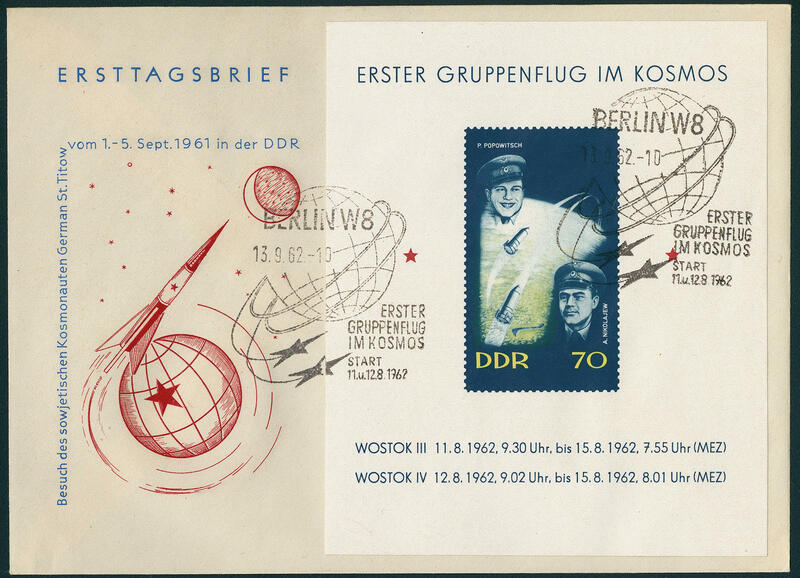 6265 FDC Bl.17 Cosmos souvenir sheet 1962, 11 in perfect condition illustrated First Day Cover. Michel 440,- €. 6266 VK 1033Probe 5 Pfg. 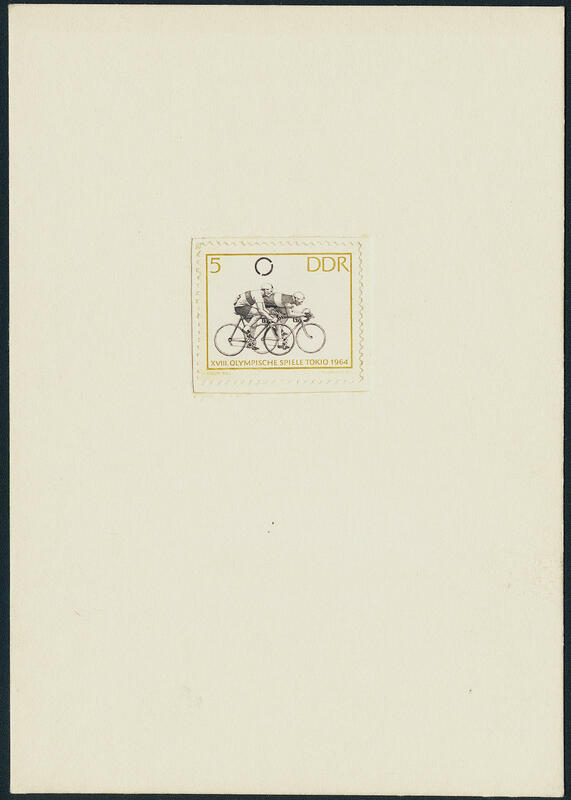 Summer Olympic Games Tokio 1964, specimen cardboard of the printing plant with a perforated proof the 5 Pfg. 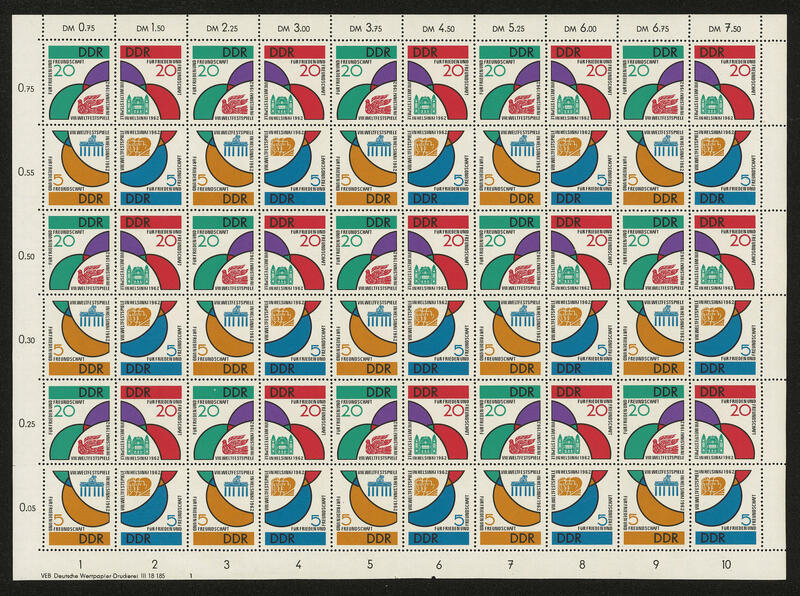 Herewith is from the olympic rings only the colour black printed out. Besides are the inscriptions, as well the numeral of value and the framework in yellow printed out. 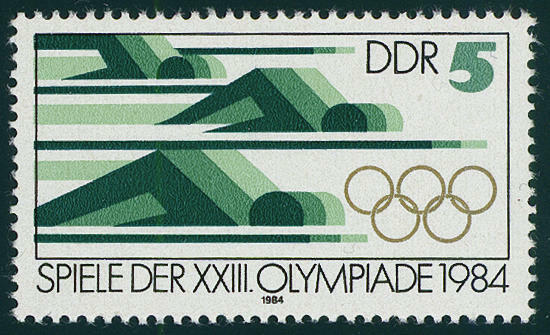 A spectacular German Demokratic Republik (East Germany) and olympic games rarity for the sophisticated special collection. In the Michel special catalogue unlisted and possibly unique! 6267 1417Uo 10 Pfg. 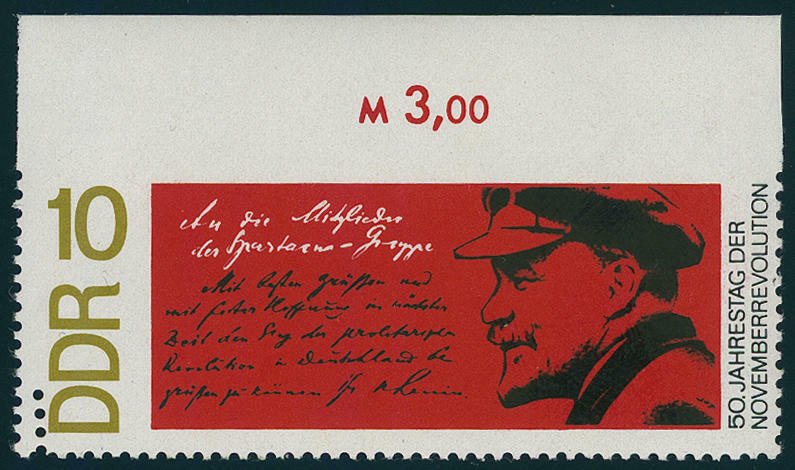 Lenin 1968 with very rare variety \"above unperforated\" from upper margin, as well left with additional partial double perforation, in perfect condition mint never hinged an extraordinarily scarce and by Michel perfect undervalued variety! 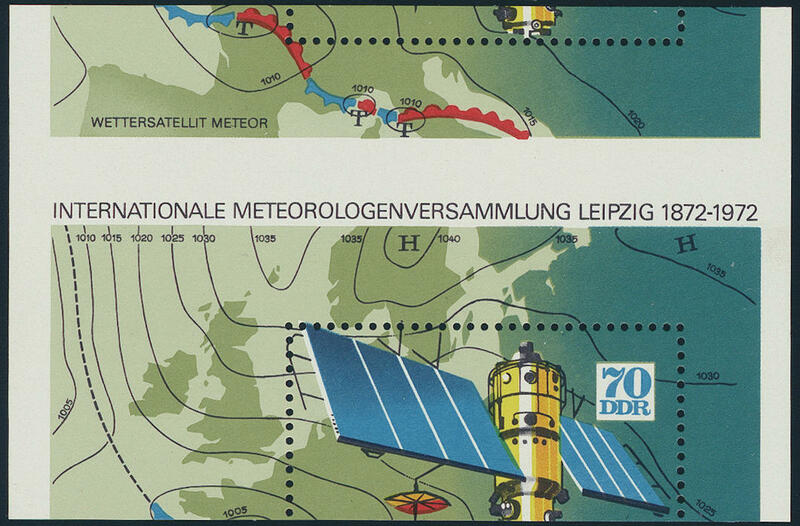 6268 Bl.36Abart Meteorological satellite meteor 1972, souvenir sheets issue extremely strong damaged in cutting, in perfect condition mint never hinged an extraordinarily scarce variety! (see notice Michel special catalogue), photo expertize Mayer BPP. 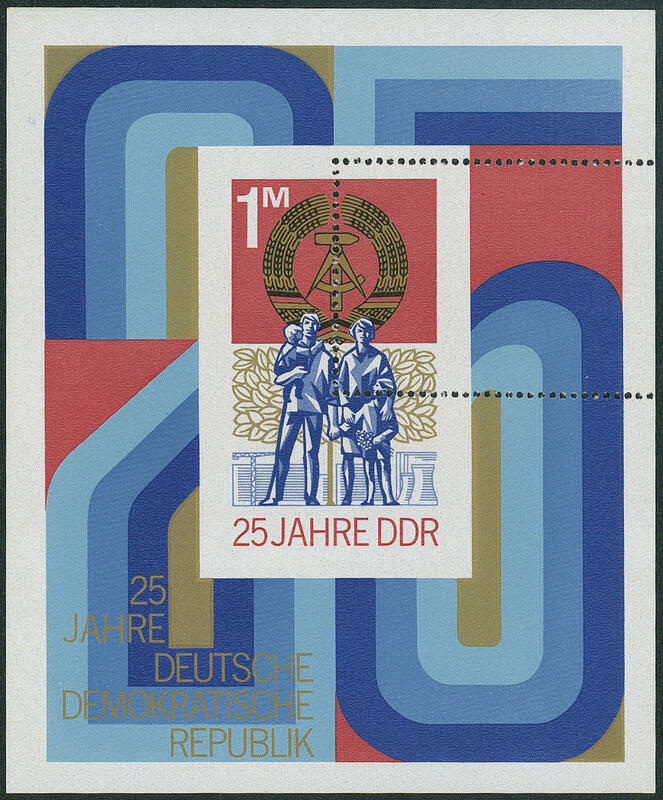 6269 Bl.41Abart 25 years German Demokratic Republik (East Germany) souvenir sheet 1974 with spectacular variety \"perforation horizontal in lieu of vertical\", fresh colors and in original size, in perfect condition mint never hinged a sensational varieties rarity of this area, the we for the first time offer can! 6270 2237F 20 Pfg. Fertilizer spreader lorry 1977 with very rare variety \"colour reddish yellow missing\", fresh colors and very well perforated, in perfect condition mint never hinged there are only few examples from this known. By Michel catalogue clearly undervalued! Expertized Tichatzky BPP. 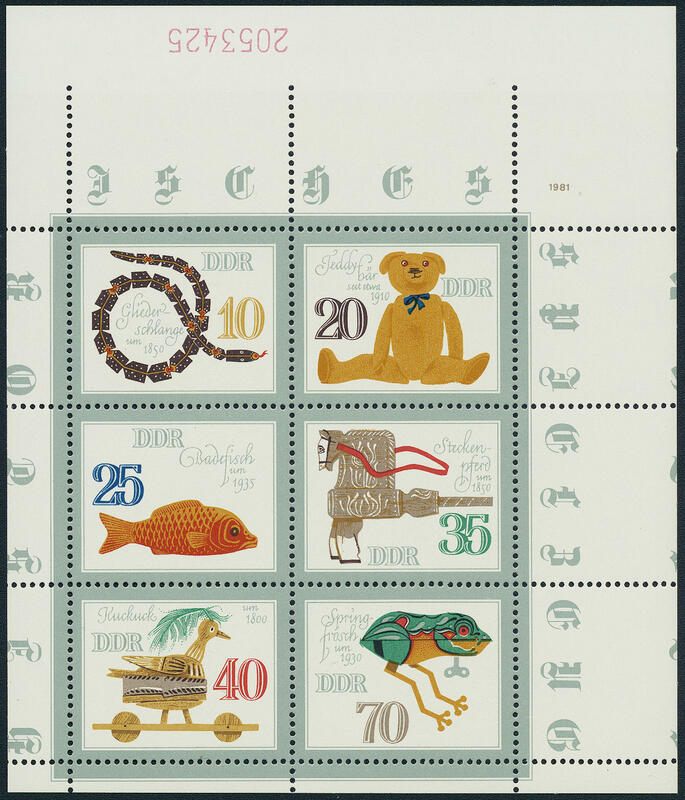 6271 2661/66Abart Historic Toy / animals 1981, miniature sheet extremely strong with defective or badly placed perforation and with inverted numbering, additional is near the 70 Pfg. Value a weak blind embossed with control number cognizable. Originated through falsify insert of the printed sheet. 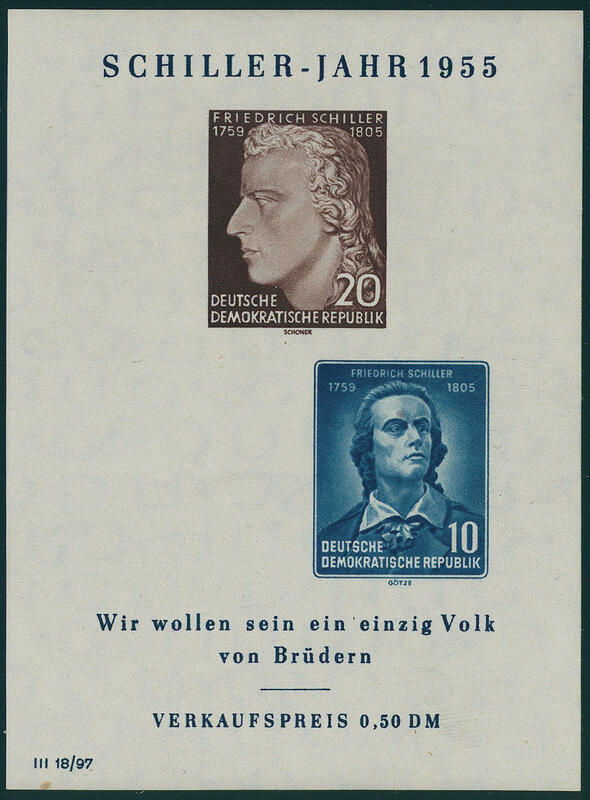 In this kind a spectacular GDR-rarity and in the Michel special catalogue unlisted! Photo expertize Mayer BPP. 6272 I 5 Pfg. Summer Olympic Games Lot-Angeles 1984, the scarce not issued stamp, fresh colors and very well perforated, in perfect condition mint never hinged, without signs. There are only few examples from this known. Photo expertize \"genuine and immaculate\" Paul BPP. Michel 3000,- €. 7120 179/86xWvR Heuss, 5, 7, 10, 15 and 25 Pfg., ribbed gum, with black counting numbers, in perfect condition mint never hinged Michel 200,- €.